The quote could not be more perfect for this stunning image. I’m flattered; thank you so much for your kind compliment, Elisa! Such a lovely photo. I really enjoyed this. (Blushing) Thank you, Virginia for your tremendous support! Once we get settled in a home again, I would love to have my favorites printed and hung on the wall, as they’re the ideal way to recall special memories ’round the world. Your photos are beautiful. I love this one! Merci, Cécile! It’s hard to believe that this path cutting through the desert used to be a golf course! Jo, the golden hour here in the high desert is beautiful – made even more golden by the flora on the surrounding hillsides! Many thanks, Sharon. I thought the two made a fitting pair. :) Sending warm wishes for happy hours on your side of the Atlantic. We’ll be on that side again soon too! Fantastic composition and processing… love it. Thanks so much, Bashar. Actually, Mother Nature processed the scene beautifully (golden hour, when the high desert’s at its best; I just boosted the picture one notch to highlight the golden surroundings). Many thanks, Anyes! It’s an inspirational quote indeed. All I can say is to echo everyone’s comments. 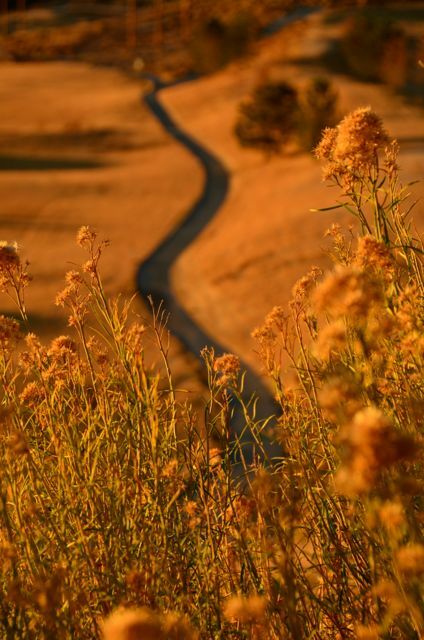 To be on that road riding through that golden landscape looks surreal. What a golden photo opportunity. You have an eye for art, design and quality, Beautiful, Tricia. Many thanks, Yvette, and welcome! It’s a pleasure to connect. I could look at that photo all day, you have caught it in the perfect light. Apt quote too! Belated thanks to you, Sasha, for your kind comment. It was indeed the ‘golden hour’ during this walk. Now that we’re in Germany’s Alps, that golden, warm scene looks even more inviting.